In this chilly winter weather, nothing makes you feel warmer than a beautiful, cozy scarf. I look forward to the fall and winter seasons, because of my love for sweaters, scarves and boots. I don't have a large collection of scarves, and neither do the ladies in my family, so this Christmas, I am planning on gifting scarves to all of the fabulous ladies in my life. Scarves have become a huge winter fashion staple, and I don't know a single gal who doesn't love wearing them. As I began shopping for scarves, I knew that I was not about to settle for just any old scarf. Like me, the gals in my life are fun, trendy, savvy, and fashion forward, so of course, I want their gifts to reflect a bit of their personalities. So, I turned to Lazy Jane's Boutique. 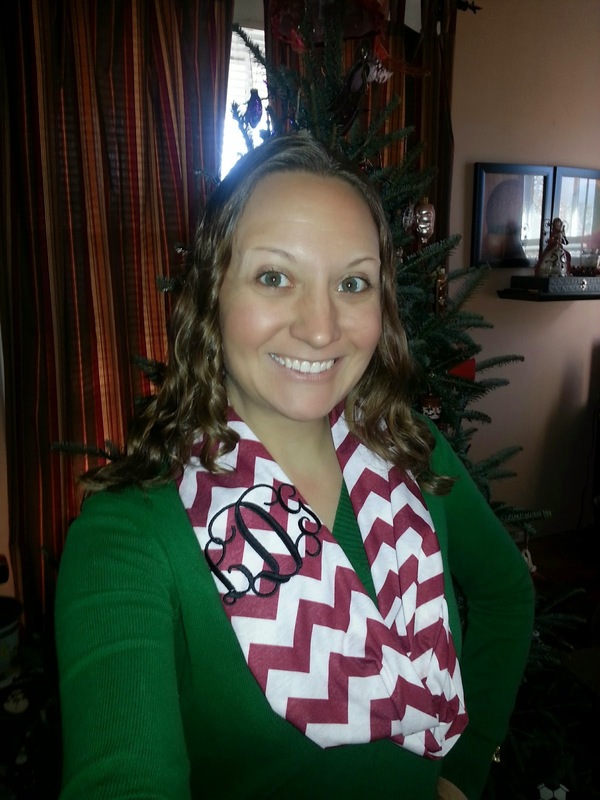 I was lucky enough to connect with owner, Julie, who offered me the opportunity to review one of her beautiful monogrammed infinity scarves. 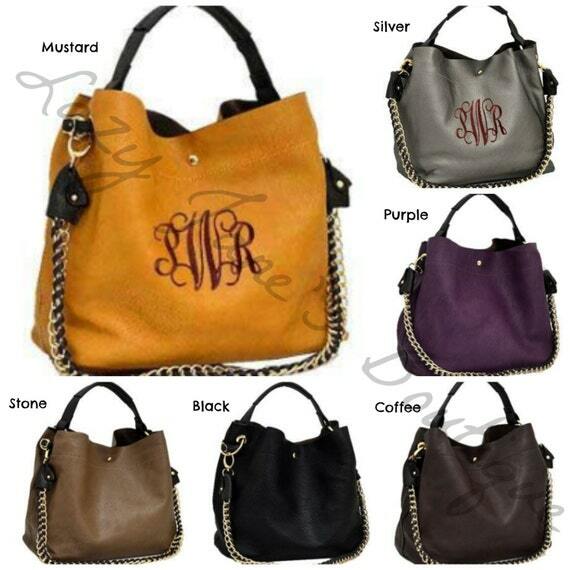 Lazy Jane's Boutique offers not only scarves, but many other sweet monogrammable products, like bags and accessories! 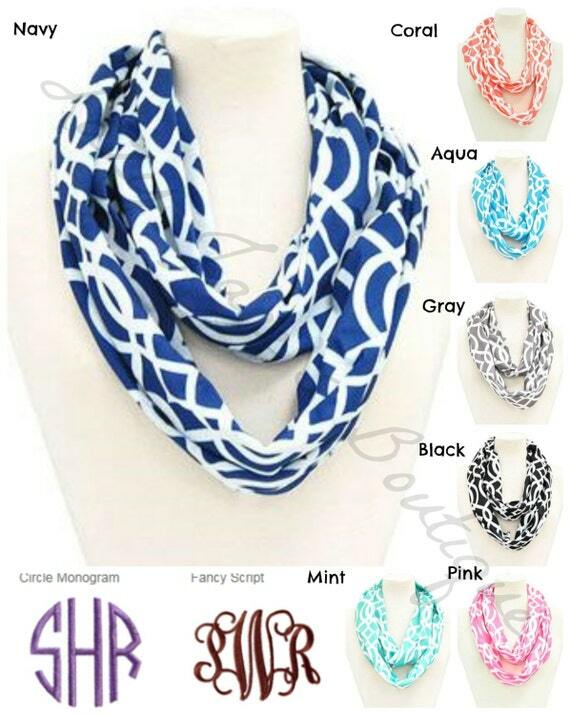 I was able to select a color that I preferred for the infinity scarf, and told Julie that I would completely trust her judgement as far as the monogram font and thread color went. I knew she would choose what she felt would look best with the scarf I picked out. It took just a couple of days for my scarf to arrive by priority mail, and I truly couldn't wait to see what it looked like! 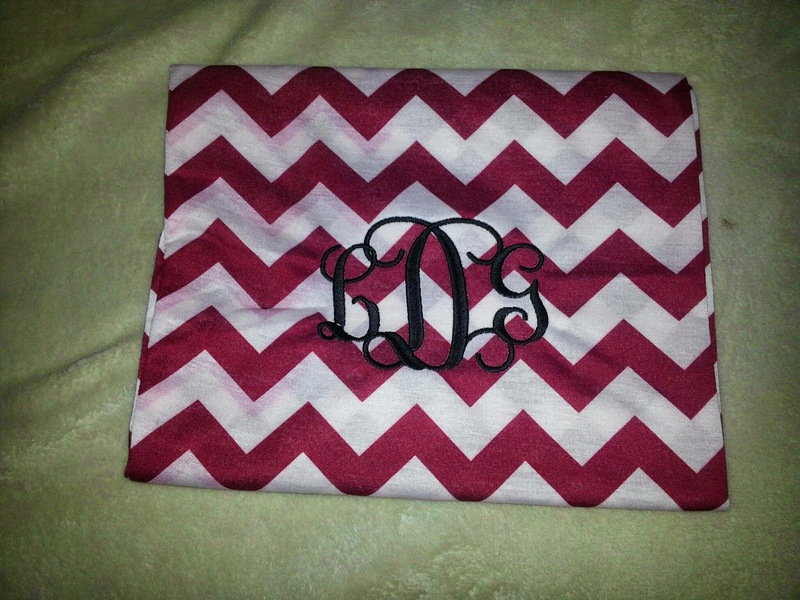 The scarf came neatly folded, with the monogram facing front and center. I immediately fell in love with the monogram. I loved the beautiful bold font, because it was so elegant looking. 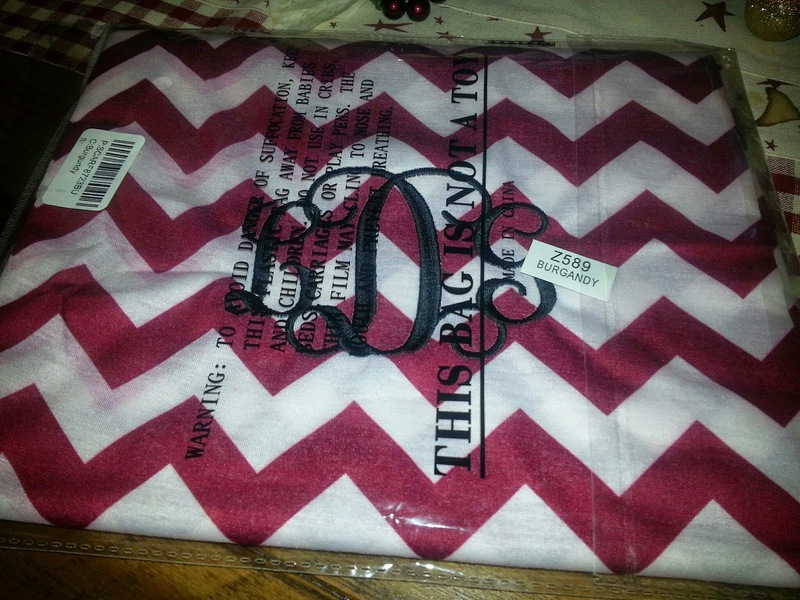 The burgundy and white chevron pattern looked so pretty. I prefer burgundy to red, especially during the holiday season, and loved the look of the burgundy against the white, and the striking black embroidery of the monogram. 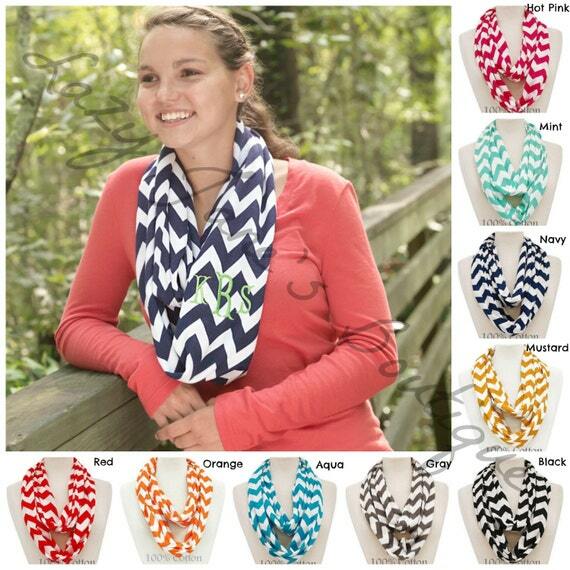 Lovely monogram, right on the front of the scarf. Here's a look at the scaf laid out, lengthwise, to give you a better idea of how long this infinity scarf is! The scarf material is a nice cotton, so it's very lightweight, and comfortable to wear. I love warm scarves, but they tend to be so darn bulky, and I often wind up removing those, unless I'm outside. This scarf is a beautiful fashion scarf, which can be worn as part of an outfit, and kept on all day long. To wear this scarf, I simply put it around my neck, looped it, and doubled it up, adjusting where the monogram displayed on the front of the scarf, because I want it to be visible. 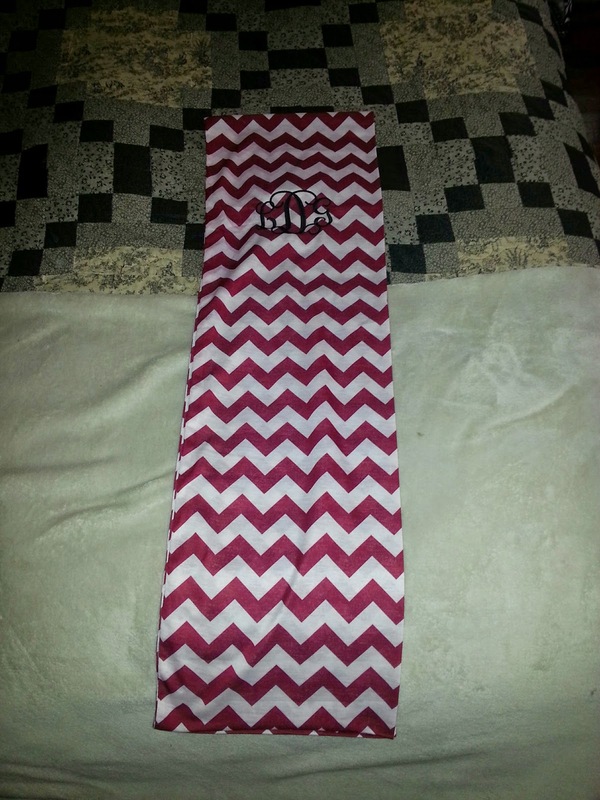 Close up of the beautiful monogram on the chevron scarf. 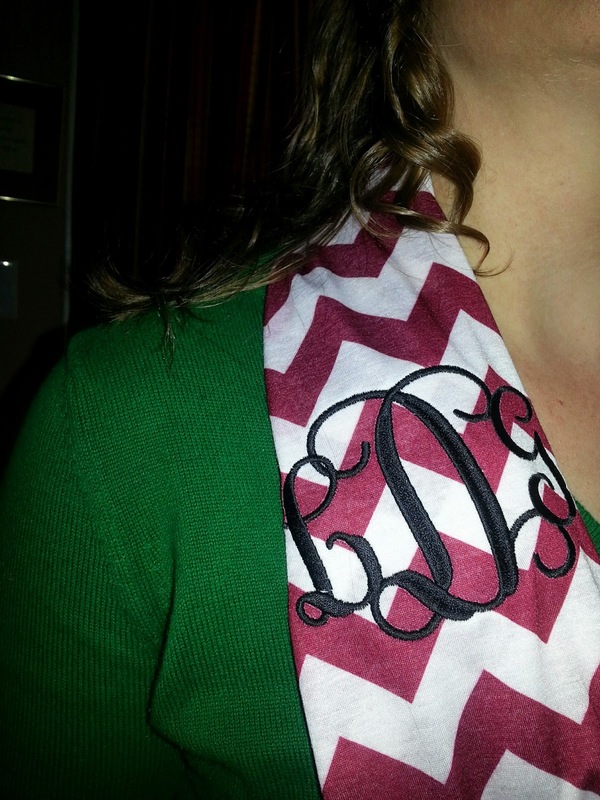 Look at how gorgeous the white and burgunday with black monogram is on top of my dark green sweater! I love this combo- it's so festive and fun! 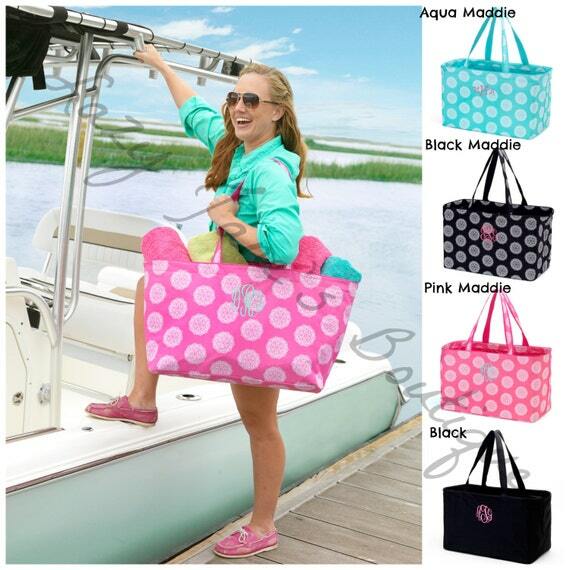 IN THE COMMENT BOX, PLEASE LIST YOUR INITIALS IN THE ORDER YOU WOULD LIKE THEM MONOGRAMMED. ALSO LIST THE MONOGRAM FONT YOU WOULD LIKE. 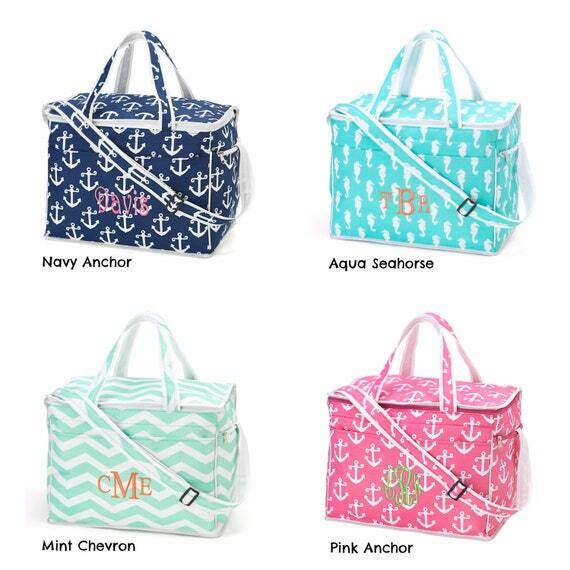 ORDERS WILL BE MONOGRAMMED IN THE ORDER IN WHICH THEY ARE LISTED. I couldn't be happier with the way the scarf turned out! I love it so much, that I definitely want to add more personalizes scarves to my collection! 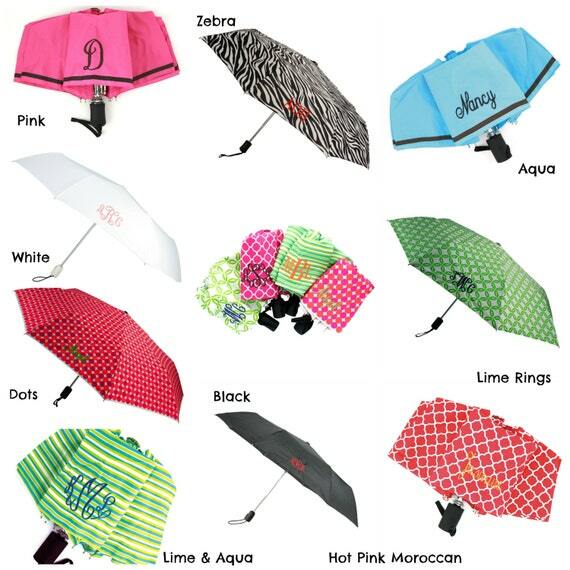 Being able to monogram and personalize so many items from Lazy Janes Boutique is incredibly awesome! Everyone loves receiving something fun and beautiful as a gift, but it's all the more special when it's personalized! I will absolutely be heading back to Lazy Jane's to select even more gifts to personalize and give to loved ones through out the year. We have so many girls in our family who would love to receive more of these items for birthdays and special occasions, in addition to Christmas! Head on over to Lazy Jane's to take a look around at all of their wonderful gift options! Be sure to bookmark the Lazy Jane website and Etsy shop, so you can go back again and again, anytime you're looking for that perfect personalized gift! Connect with Lazy Jane's on Facebook for special deals, and you can also connect on Twitter and Instagram. To receive deals and updates via e-mail, sign up for the Lazy Jane Boutique newsletter. 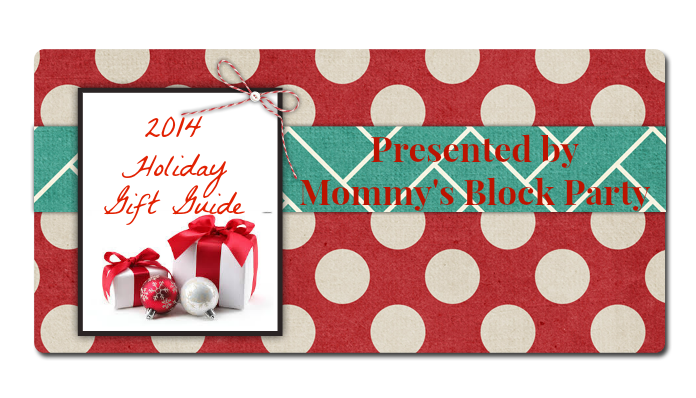 Special thanks to Julie over at Lazy Jane's Boutique for allowing me to share about their beautiful selection of monogram gifts this holiday season!